Last season, Benito van de Pas was in peak form, winning three Players Championship events, putting up a great display against Gary Anderson in the worlds, and many felt that it was only somewhat mediocre TV form that had kept him out of the Premier League. This season looked to be one where he could really try to push on into the top 10, but it's not happened. He's been disappointing in almost every event he's played in, with a couple of minor exceptions - he looked really on point in the Grand Prix, running over Cristo Reyes and Gerwyn Price, the Price match in particular being amazing, averaging 95 in double start, before the wheels would come off against eventual finalist Simon Whitlock. 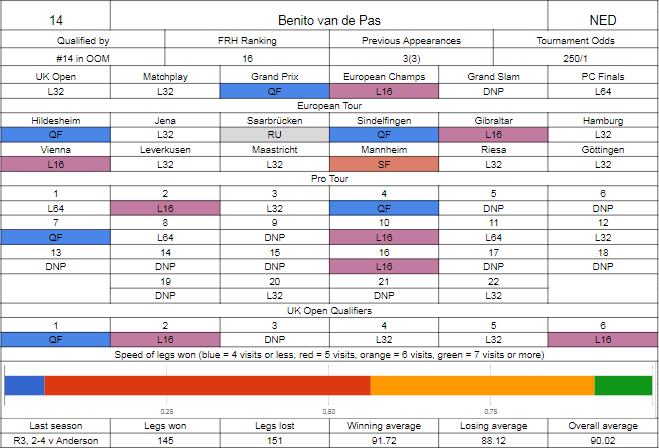 Benito has also done OK in Europe, where he reached one final in Saarbrücken, only losing by the odd leg in eleven against Peter Wright having beaten Rob Cross and Ian White (who had beaten van Gerwen for the loss of just one leg earlier in the evening), and having a solid run in Mannheim to the semi final, where this time Rob Cross would come out the victor. Apart from that it's been mediocre - 10 Pro Tour events where he lost in the first round, getting an easy round 3 UK Open draw in Matthew Dennant before losing to Alan Norris, losing in overtime to Daryl Gurney in Blackpool, needing a deciding leg in Hasselt to eliminate van der Voort before losing in the same way to Michael Smith, not qualifying for the Grand Slam, then losing in the first round at Minehead to Stephen Bunting. As a bonus, he entered the world youth as the number 1 seed and lost in the first round to Jeffrey de Zwaan. 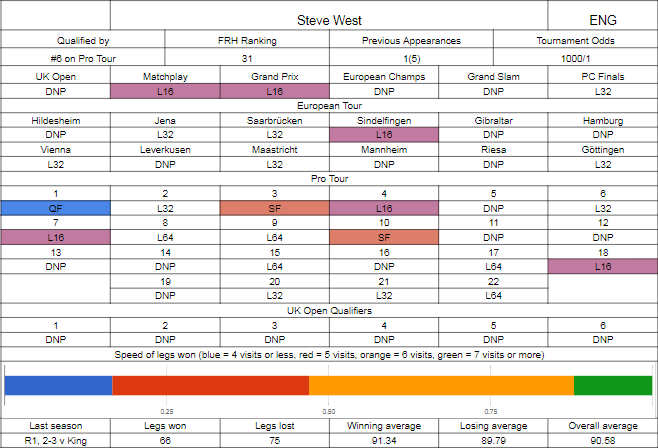 West broke through on the back of some good floor results last season and has consolidated well, not quite enough to reach the top 32 although he's not far off, but playing well enough to comfortably reach the big majors that work off the Pro Tour rankings. His UK Open qualification attempt was a disaster, as he didn't pick up a single cash, but quickly turned that round in the Players Championship weekends that bookended the main event with three board wins and a board final defeat, two of which he turned into a quarter final and a semi final, the latter seeing wins over Chisnall and Smith before losing a deciding leg to Mervyn King. 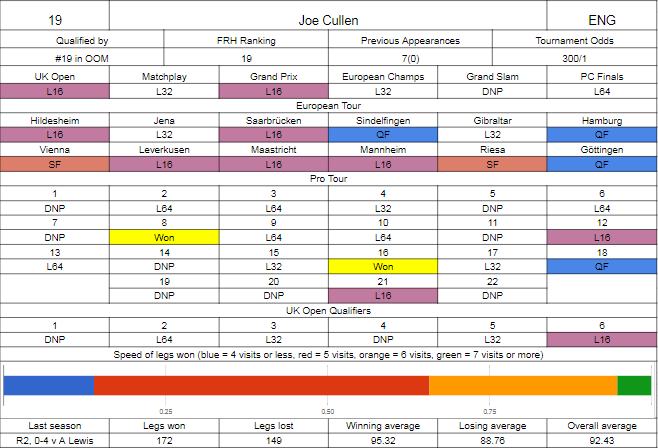 He'd pick up a second semi final the following month, which was mostly a favourable draw special, and had his best European Tour run the week later, reaching the last 16 in Sindelfingen with wins over Chris Dobey and Michael Smith. That'd be the peak of his European adventures, he was still seeded for some but a first match exit hurt his chances of making Hasselt, and he eventually failed to make that event. The other majors were alright - he won his opening game at Blackpool with a great display against Michael Smith before Darren Webster turned him over, and was able to eliminate James Wade from the Grand Prix before getting rolled by Mensur Suljovic. He couldn't do much at Minehead with his seeding giving him a second round draw against Michael van Gerwen, but at least he got there. West has done some of his best work on TV, with a high percentage of four visit kills showing how he can be dangerous on that level. This is an important game for Benito, there's nobody in this section he cannot beat and he is perfectly capable of getting through to a fourth straight last sixteen appearance, which would be a projected rematch against Gary Anderson, but he's got to do it still. In his favour is that West has never won a match at the world championship (either here or Lakeside), and while it shouldn't, it may play on his mind psychologically, particularly given he really should have beat Mervyn King last season. Cullen's had an outstanding season, following last year where he finally broke his world championship duck in a first round highlight slugfest against Corey Cadby. He's not quite got the TV game to match his greatly improved floor game yet, but it's coming, and he's one of numerous players that could have an outside shot of the Premier League with a good run here. Joe had a bit of a sluggish start to UK Open qualification, but just got enough on the last day to make round 3 automatically. From there he crushed Thornton and easily dispatched Reyes, before taking Kim Huybrechts to a deciding leg. The key breakthrough would come a month later, where in Barnsley he got his first ranking win - he didn't face an FRH top 20 until the final against Daryl Gurney, himself fresh off a first ranking win, but held his nerve in a deciding leg to get over the line 6-5. This helped him to lock down a high enough Pro Tour ranking to get seeded for all the European events, where he's had a great record - only losing in round two twice and pushing on to the final session on five occasions, not quite being able to make a final, losing out to Michael Smith and Kim Huybrechts in two semi finals. On the floor domestically, he would add a second title in the run up to Blackpool, beating surprise package Zoran Lerchbacher in the final having earlier eliminated Gurney in the semis and Benito van de Pas in the last sixteen, but drew Barney at Blackpool and held his own for long periods before falling 10-8. Cullen did get a TV win over Darren Webster in Dublin, but lost to Daryl Gurney in the second round where it looked like he was going to rage quit, stopping himself from chucking a dart away as he fell to a two set disadvantage. He was seeded in the European Championship, showing how well he has done on that circuit, but lost a deciding leg to Stephen Bunting in round one, only able to leave 130 after twelve which had no chance following a bounceout. The last two majors would be a double disappointment, not making the Grand Slam through his Pro Tour wins and losing to Steve Lennon in the final round of qualifying, and then lost to Jamie Caven out of nowhere in the opening round of the Players Championship finals. Wattimena's here for a fourth time having yet to make it to round two, previously losing to Gurney, Suljovic and Marijanovic (in a prelim) but winning a set in each of the two first round events, so this is possibly his best chance yet, although he is facing a player on a big upward trend for the third straight year. Jermaine's one of a few European players that have been hanging around outside the top 32, not quite being able to push through further, but there are signs that it could be coming - he won three games at the UK Open, putting out Kyle Anderson in the opening money round before running Michael Smith close in a 10-8 reverse, and has had overall better floor form with three Players Championship semi finals, two of them in the last three weekends so they should give him a good start for next season's Matchplay qualification. He maybe could have done more in Europe - only qualifying for five events and not being able to make Sunday once, falling to van Gerwen having beaten Bernd Roith, Dirk van Duijvenbode, Steffen Siepmann, Ian White having beaten Michael Plooy, and Michael Smith having beaten Mick Todd. He was able to put in a good showing at the Players Championship Finals, eliminating Keegan Brown in what was clocked at about ten minutes 6-0, seeing off the conqueror of Gary Anderson, Michael Mansell, in round two, before pushing Steve Beaton all the way to a deciding leg, bowing out 10-9 at the last sixteen stage. 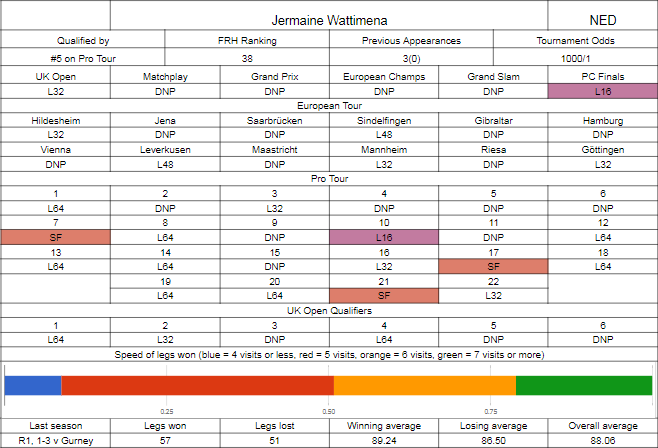 Cullen's numbers are all round better, clocking up a respectable 14% of legs won in four visits, and is easily outperforming Wattimena in legs won in five visits, pushing over 65% while Jermaine's barely over 50%. The confidence he's gained on the floor this year should serve him well, but he's shown frustration on occasion when he's not playing as he knows he can, and can easily throw in three-four visits without a treble and cost himself legs, which Wattimena could pounce on. Don't think this'll be 3-0, but do think it'd be a case of Cullen losing it rather than Jermaine upping his level and claiming it himself if it was to be an upset win for the Dutchman.